Summary: Palatial seven bedroom luxury residence of grand proportions, boasting 8,474.42 square feet of beautifully finished accommodation and located within a 1.5 acre plot (approximate - not measured) in the prestigious area of Barnt Green, Birmingham. Description: 'The Laurels' has been designed to an exacting standard and has a superb balance of informal and formal entertaining and flexible family accommodation. There is a real emphasis on bright, light and airy accommodation throughout and as soon as you walk through the grand double front doors, you are greeted by a most impressive entrance hall complete with two cloaks cupboards, Belguim marble tiled flooring and a superb staircase with glass balustrade. The hall provides access to a generously proportioned drawing room with a modern gas inset fire and two sets of patio doors onto the garden. The breakfast kitchen (designed and fitted by Knightsbridge Kitchens) is a hub for day to day family life and features granite worktops and Siemans and Miele integrated appliances. The adjacent utility room is accessed through a hallway which also provides private entry to the annex accommodation. The ground floor is complete with formal dining room, conservatory, cinema room and sizeable games room with feature colour change lighting. The games room leads to a splendid indoor heated swimming pool complex featuring a gym room and two changing rooms with shower and WC. A ship ladder ascends to the first floor and provides direct entry to substantial walk in roof storage, eaves storage and corridor leading to a roof terrace and access into the dressing room of the master bedroom. From the hall, a state of the art staircase leads to a contemporary galleried landing with front facing balcony and tremendous master bedroom suite. The master bedroom features a dressing room and concealed entry to a designer bathroom with Jacuzzi bath, wall inset TV, heated marble tiled floor and a shower and steam room. Beyond the archway from the landing, there are six further bedrooms, three with en suites and separate family bathroom to bedrooms five, six and seven. Bedroom two enjoys rear balcony access and also benefits from a recently re fitted roof with 25 year warranty. The left hand side of the house offers a series of rooms ideal as an annex wing (also with it's own private entrance). Designed to be independent of the main house, although connected, this area includes a bedroom (current bedroom six), living room (current bedroom five), kitchen and bathroom. Outside: The Laurels is approached through a set of wrought iron security gates opening onto a block paved drive with mature hedging providing a great deal of privacy. 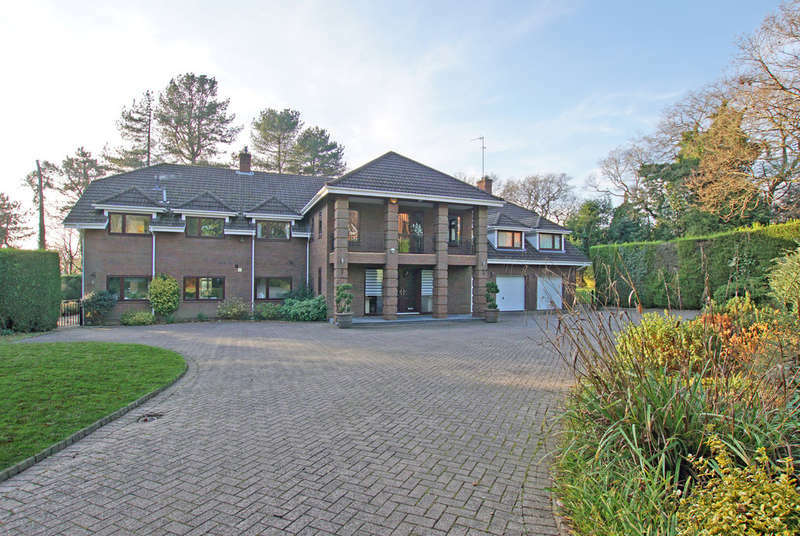 The driveway provides access to a generous three car garage with electric doors and also houses the boiler room. The delightful manicured rear gardens are predominantly laid to lawn and surround the majority of the property (the plot totals approximately 1.5 Acres - not measured). There is also a slate al fresco dining terrace and summerhouse. Location: Barnt Green is a delightful village offering a variety of amenities including local shopping facilities, doctor's surgery, two churches, dentist, St Andrews First School and train station (direct access to Birmingham New Street in 29 minutes). Barnt Green is also home to the ever-popular Grade II listed 'Barnt Green Inn' and conveniently located for many fine walks, including the renowned Lickey Hills Country Park. There are also many sporting facilities including a cricket club, Blackwell Golf Club, sailing and many other clubs and societies. There is easy access to M5/M42 motorway links, Birmingham Airport and Birmingham City Centre is approximately 11.3 miles away. Disclaimer Property reference 104416_101055007602. Details are provided and maintained by Arden Estates. Nethouseprices.com makes no warranty as to the accuracy or completeness of aforementioned details.